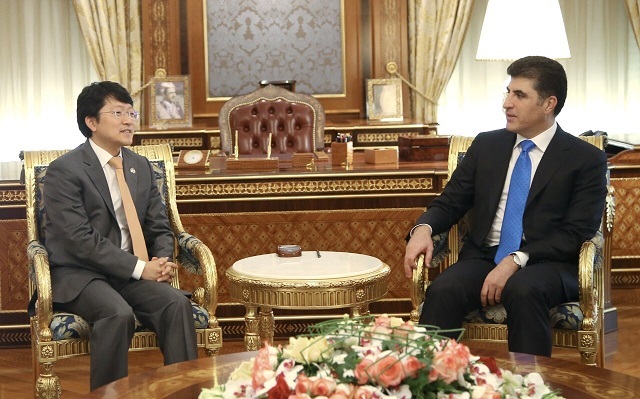 Erbil, Kurdistan Region, Iraq (cabinet.gov.krd) – Prime Minister Nechirvan Barzani received Mr. Park Young-Kyu, the Consul General of Korea in Erbil and his accompanying delegation. Mr. Park conveyed a letter from Mr. Moon Jae-In, President of the Republic of Korea, inviting stronger relations between Erbil and Seoul. He expressed Korea’s readiness to cooperate with the Kurdistan Region on technology development and discussed the Korean International Cooperation Agency’s (KOICA) capacities to help with electricity production and distribution. He also expressed his government’s interest in helping to strengthen the public sector and said next month they will open a center to train public employees. Prime Minister Barzani expressed his appreciation for President Moon’s letter and stressed the KRG’s desire also to strengthen bilateral relations between Erbil and Seoul. Prime Minister Barzani said that the KRG will welcome Korean companies to invest in the Kurdistan Region and share their expertise, especially in the field of e-governance.